A lady, the wife of a wealthy farmer living near Toronto, in Canada, was walking about the farm one day. In the course of her walk she was crossing a plank-bridge which crossed a deep and rapid stream that ran through the farm. In crossing this she missed her footing and fell into the water. Now she was in the greatest possible danger. She was encumbered with her clothing ; she could not swim, and there was no one within hearing to render her any help. But in the field through which that stream flowed her favourite horse was grazing. This horse had always been treated by his mistress with the greatest kindness, and always seemed to be grateful for it. But we should hardly have expected that in this state of things a horse would be able to understand the danger to which his mistress was exposed. But this horse did. 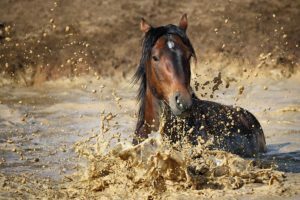 On looking around and seeing his mistress struggling in the water, he started, and galloping to the edge of the stream, plunged in and swam towards her. Then he took hold of her dress and brought her safely to the dry land. And in doing this he was only returning to his mistress the kindness she had showed to him.